Nobody can describe the amount of loss one feels when their house has been severely damaged by a fire. Whether the cause was from a lightning bolt or a blown circuit, these natural disasters are usually not something we expect to happen. Thankfully, home insurance can assist with the costs of replacing the household items that were lost in the flames. However, there are a number of steps to take when filing a claim for a house fire. Here you can learn about how to get the most out of your claims when dealing with your insurance. While it is devastating to lose a part of the home to a house fire, you might be surprised to find extra damage incurred later even after the flames have been extinguished. This is because the soot, smoke, and other byproducts left behind will cover the building materials and personal items. They will quickly cause etching and tarnishing if not removed right away. This is where the fire damage restoration professionals need to arrive right away in order to prevent these extra damages from occurring. They will properly restore all building materials and personal content back to their original condition. Your home may also need emergency board up and tarping services if necessary to prevent water leaks from rain. But when the fire restoration service (such as ServiceMaster) is called right away, insurance will cover their costs. Whether you choose to stay at a hotel or a friend’s house, you will need your everyday belongings, such as clothes and toiletries. This is where your insurance should cover the bill. Before you buy these items, ask your insurance for an advance so that you are well taken care of after the natural disaster. However, keep in mind that the insurance will only cover the “actual cash value” of your items after the fire restoration. Unfortunately, you won’t be able to go on a shopping spree as you will pay the difference for the more expensive and unnecessary items. But if you ask an agent, they might be able to deliver you a check to cover the essentials you will need throughout the fire restoration process. This process can get quite complicated as some insurances may promise one thing in the beginning of the fire damage restoration process, but when it comes to the details of costs, they are not so kind. 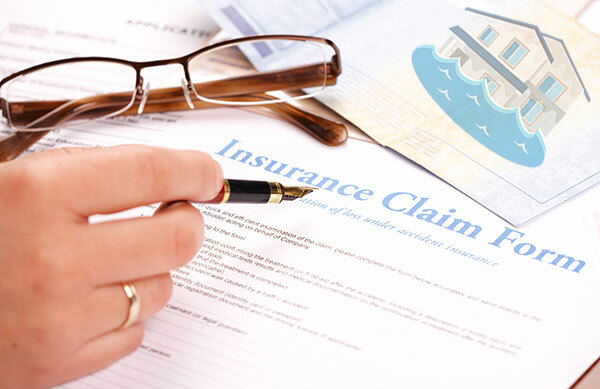 First, you will be asked to submit a “proof of loss claim.” In this case, you must document the loss of all items and list its value before the damages were incurred. But make sure to get this done as soon as possible as insurance companies may have a long list of claims they need to process before they get to yours. Document all forms of communication: the bigger the house, the bigger the claim. In these situations, there will be significantly more communication as to which costs will be covered by whom. Be sure to save all e-mails and letters in addition to taking notes during each phone call and recording the date. Finally, organize all estimates, bills, permits, contracts, and invoices into separate categories (by room, use, or cost). This will work greatly in your favor if there is ever a dispute between you and your insurance provider when it comes to who said what and when. Thankfully, by law, insurance companies are required to act within a timely manner to all claims. This is for your safety and preventing additional costs down the road. In these cases, be sure to ask your agent when documents will be processed, when someone will arrive and give an estimate for the fire damage restoration, and when you will be getting the bill. This way, if they are late in any part of the process, you can call and ask why something was late. Finally, you are assured that all processes will be running smoothly and know when each step will be completed. There will come a point as part of the claims process that the insurance companies will ask you about your living expenses. Unfortunately, you won’t be able to throw them a random number. In this case, you will need to explain your living expenses so that they can compensate you fairly. Although they will only compensate for the additional expenses, such as eating at a restaurant compared to buying groceries, be sure to do the math and calculate the difference. Your home may require reconstruction or replacement as part of the fire damage restoration, depending on the amount of damage incurred from the fire. To decide what is best for your situation, it is recommended to have your home looked over by experienced professionals. They can perform simple content cleaning, pack-out services, and full reconstruction. Whether this is covered or not within your policy, it is essential to have these services done in order to avoid smoke and soot damage to your home. House fires are always a traumatic experience. It is times such as these where friends and family are needed to support you emotionally, mentally, and sometimes financially. When involving a trusted family member or friend, you are given the support and encouragement throughout the entire fire restoration process. They can even help when dealing with the insurance claims. Whatever you decide to do, it is highly recommended to involve them not only for support but as a witness to the fire damage restoration process.